Jack Andraka is a flipping genius and consumers are going to benefit greatly from his IQ. Andraka is a sophomore in high school and this past December, he won Intel’s prestigious Gordon E. Moore Award along with other top honors at the corporation’s annual Science and Engineering Fair, the world’s largest high school research and science competition. So what did this genius do? 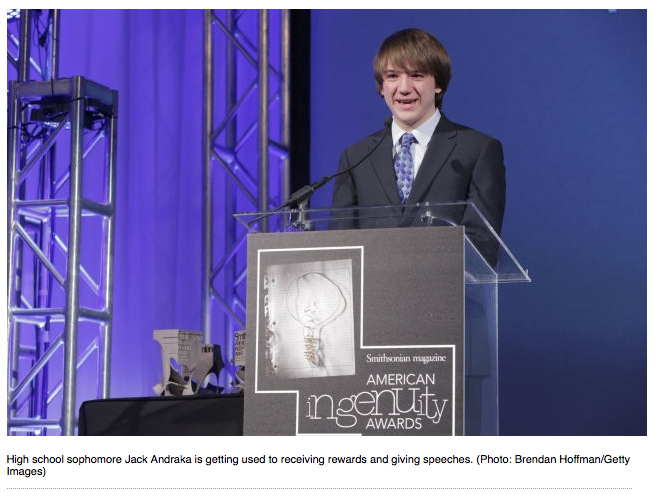 Jack Andraka created a simple dip-stick sensor to test for levels of mesothelin, which is a biomarker for early-stage pancreatic cancer that’s found in blood and urine. The method is similar to diabetic testing strips, utilizing just a pinprick of blood and costing just pennies to make. So What Does That Mean to You and Me? So what does that mean to consumers like you and me? What makes Andraka's methods for pancreatic cancer detection so incredible, aside from being incredibly inexpensive, is that consumers can find out about their cancer early enough to treat it with a positive outcome. Current tests for pancreatic cancer are in most cases so ineffective, that they are unable to detect the cancer until it is too late to treat. Andraka feels that his tests could take the survival rate from a dismal 4% at 5 years to nearly 100% saving the lives of approximately 40,000 people a year. But if you can believe it, the news gets even better than just saving tens of thousands of lives from pancreatic cancer because the strips can be made to detect biomarkers for other diseases as well, theoretically savings millions. Andraka, in the crux of youth's exuberance could be changing the lives of millions of consumers by bringing low cost diagnostic testing to all, many who otherwise would not have been able to afford costly tests. Jack is already in talks with major corporations like QuestDiagnostics and LabCorp to bring his kits to consumers. Will keep you posted as I get more info. Cool story, cool kid. Every year approximately 1,500 high-school-age scientists, engineers, mathematicians and technologists from almost 70 countries come to the United States to complete for nearly $4 million in prizes at the Intel International Science and Engineering Fair. Shining-star Jack is just one example of the brilliant young people who are developing into the world's next generation of innovators. If you want to be a part of discovering and encouraging the next Jack Andraka, I heartily encourage you to consider volunteering at the next Intel ISEF in Phoenix, AZ this May. Details are at: http://www.societyforscience.org/intelisef2013. I guarantee it will be one of the most memorable experiences of your life!